I've used all Stampin' Up! products for this card. I dyed the small ribbon on the image with Really Rust marker pen ...... ok you don't get an exact colour match every time .... but it's close enough :o) I also used the marker pens - Really Rust, Old Olive and More Mustard to stamp the image with. Superb Terri, I love it.. This is wonderful!!! what wonderful colors and pretty image!! 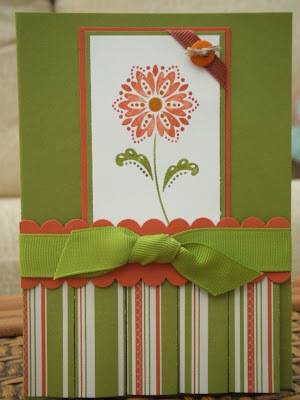 Love your gorgeous cards and other creations....lovely blog. Teri this is a gorgeous card!! I love the colors you used. I have this set and have only used it once. hmmm maybe i'll try it again after the inspiration you've given me. Thanks so much!! Gorgeous! I'm loving every single thing about your card. especially the color combo! This is great, I love the colour combo. Thank you so much for joining in this week. Fab, love the paper pleating and the 'dyed' ribbon - great idea to get a perfect match.